The Puerto Rico Electric Power Authority (PREPA) —Spanish: Autoridad de Energía Eléctrica (AEE)— is an electric power company and the government-owned corporation of Puerto Rico responsible for electricity generation, power distribution, and power transmission on the island. PREPA is the only entity authorized to conduct such business in Puerto Rico, making it a government monopoly. The authority is ruled by a board of directors appointed by the governor with the advice and consent of the Senate. Since 2014, PREPA is subject to the Puerto Rico Energy Commission, another government agency whose board of directors is also appointed by the governor. On January 22, 2018 the governor of Puerto Rico, Ricardo Rossello, announced that all assets of the Authority will be sold in a general privatization of PREPA. PREPA was originally named the Puerto Rico Water Resources Authority (PRWRA)—Spanish: Autoridad de las Fuentes Fluviales (AFF)—which was created by Law No. 83 of May 2, 1941, during the governorship of Rexford G. Tugwell. Government-owned, PRWRA unified diverse regional and local electric power companies into one unified electric grid. Throughout its history, PREPA has suffered several outages that have left the entire island of Puerto Rico without power. One of these islandwide outages occurred on September 20, 2016 due to a fire at one of PREPA's plants—Central Aguirre. All of Puerto Rico was without power for three days. At the first days of September 2017, the eye of Hurricane Irma passed north of the island. The strong winds left 1 million residents without power. Power had been restored to 980,000 people by September 20, when Hurricane Maria struck, leaving nearly the entire island without power. Two weeks later, power had been restored to about 10% of customers. Full restoration was expected to take months, and many Puerto Ricans bought generators. Electric companies in unaffected areas ordinarily make contracts for speedy assistance to those hit by disaster, but in this case negotiations took weeks. The initial $300 million contract for power restoration was given to Whitefish Energy, a Montana company which had only two employees on the day the hurricane struck. The award was controversial on those and other grounds, and was cancelled on October 29. By December 2017, the Army Corps of Engineers had other contractors in place, along with crews brought in through mutual aid agreements with utilities such as Con Edison. Six weeks after Hurricane Maria, 30% of customers had been restored. After two months, almost half had been restored. In January 2018, it had been predicted that generation would reach 95% by the following month, and 100% of customers would be restored by June 2018. On April 18, 2018, an accident at a transmission line knocked out the electrical grid of Puerto Rico. All the island lost power. The following afternoon, PREPA announced that service had been restored to 97% of customers, the same percentage as before this blackout. 40,000 customers were still out of service due to the hurricane seven months earlier. 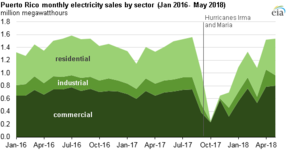 With June 1 the official start of the 2018 hurricane season, an estimated 11,000+ customers remained without power, possibly for another two months. Although an estimated $3.8B was spent on power grid work since the September hurricanes, the grid is still considered fragile and vulnerable. PREPA announced a $500M one-year master services agreement with MasTec for further power grid reconstruction and modernization services. The board of directors is the governing body of the Puerto Rico Electric Power Authority. Its membership usually consists of private citizens who are supposed to represent the public interest and may or may not include exofficio political officeholders (typically the Secretary of Economic Development and Commerce). This inconsistency happens as the board's structure changes whenever a political party gains power, usually every four or eight years. When both the governor and the legislature of Puerto Rico belong to the same party, one of the earliest laws amended by the legislature is the one governing PREPA in order to change its board's composition. Once a new board is settled in, one of its first resolutions is to appoint a new executive director. These frequent changes effectively make the authority a partisan tool rather than a mere electric utility and, consequently, change the vision, strategy, and plans of the authority every four or eight years according to the political party in power. Of the different members of the board, the governor is usually required to appoint four members with the advice and consent of the Senate. It is through these members, along with the incumbent political officeholders which serve as ex officio, thus the governor and the political party in power effectively control the authority. Three additional members of the board are directly elected by consumers by plurality-at-large; two of them by residential consumers and one by commercial ones. The last structural change to the board occurred on June 11, 2018 after governor Ricardo Rossello. Puerto Rico has 21 hydroelectric plants rated at a combined 156MW. The public corporation also provides fiber optic broadband to private carriers through one of its subsidiary, PREPA Networks. PREPA is also studying the possibility of selling energy to the United States Virgin Islands with the installation of an underwater power cable between Fajardo and the island of St. Thomas—similar to the power cable with which it services its clients in Vieques and Culebra, which are also islands. There are four labor unions that represent the workers from the authority exclusively UTIER, UITICE, UEPI, and UPAEE. PREPA's operating expenses for FY2013 denote how fuel purchases take over 58% of the authority's operating expenses. As of 2014 the authority carries liabilities of $10.1 billion USD against assets of $6 billion. It also operates with a deficit of about $354 million against revenues of $4.8 billion. In terms of costs, $2.6 billion or about 58% of PREPA's expenses are attributed to fuel purchases alone while salaries and collective bargains represent less than 13% of the authority's expenses. On May 23, 2014, Citigroup severely curtailed PREPA's line of credit for fuel purchase, forcing PREPA to run out of cash to pay Petrobras, its main oil supplier. Petrobras, in turn, threatened to cut off further shipments to the authority. This forced the authority to take $100 million out of its Capital Improvements Fund in order to pay its debt to Petrobras. PREPA argues that the different agencies of the government of Puerto Rico owe them more than $290 million in debt, while an additional $375 million of revenue is lost through subsidies enacted by the Puerto Rican legislature. An additional $600 million is owed to the authority by residential and commercial consumers, some of them by consumers living in public housing. The authority argues that it wouldn't have a problem being self-sufficient if it were paid the aforementioned debt and if it weren't forced to give out subsidies. On June 3, 2014, senator Ramón Luis Nieves admitted publicly that, "part of the financial problem at PREPA was provoked by the government and the Puerto Rican legislature." On June 11, 2014, Fitch Ratings downgraded its rating on the authority's to speculative non-investment grade ("junk status") from BB+ to BB while putting the authority on negative rating watch. PREPA filed for bankruptcy in July 2017. Palo Seco Power Plant, 1973. Photo by John Vachon. ^ "Ley de la Autoridadf de Energia Electrica de Puerto Rico" (PDF). Presupuesto.gobierno.pr. Retrieved 2015-03-03. ^ "Why Hurricane Maria left Puerto Rico completely without power". The Verge. Retrieved 2017-09-28. ^ "Welcome to PREPA". Prepa.com. Retrieved 2015-03-03. ^ "Puerto Rico blackout leaves more than 1 million without power". NBC News. Retrieved 2017-12-16. ^ "Special Report: The bankrupt utility behind Puerto Rico's power crisis". Reuters. 2017-10-05. Retrieved 2017-10-06. ^ Fausset, Richard; Robles, Frances; Acosta, Deborah (2017-10-07). "Minus Electrical Grid, Puerto Rico Becomes Generator Island". The New York Times. ISSN 0362-4331. Retrieved 2017-10-11. ^ Borak, Donna (October 25, 2017). "San Juan's mayor takes on small Montana firm over Puerto Rico power contract". CNN. ^ "Working To Get The Lights Back On In Puerto Rico". Marketplace. December 1, 2017. Retrieved 12 December 2017. ^ "Puerto Rico power restoration: Why it is taking so long". USA TODAY. Retrieved 2017-11-01. ^ "When will Puerto Rico have power? Half of island still without electricity after head of power authority resigns". Newsweek. 2017-11-18. Retrieved 2017-11-24. ^ "As hurricane season begins, 11,000 customers in Puerto Rico still without power". CBS News. Retrieved 14 June 2018. ^ Weissenstein, Michael. "As hurricane season begins, 11,000 customers in Puerto Rico still without power". Associated Press. Retrieved 14 June 2018. ^ Lievonen, John. "MasTec snags $500M contract with utility in Puerto Rico". www.bizjournals.com. Retrieved 14 June 2018. ^ Walton, Robert. "Puerto Rico's utility signs $500M recovery contract with MasTec". Utility Dive. Retrieved 14 June 2018. ^ "Proponen suspender subsidios de la AEE por seis meses | El Nuevo Día". Elnuevodia.com. 2014-06-25. Retrieved 2015-03-03. ^ "Press Release". AES Solar. September 30, 2011. Retrieved September 7, 2013. ^ "AES : Homepage". Aespuertorico.com. Retrieved 2015-03-03. ^ a b "Central Aguirre" (in Spanish). Puerto Rico Electric Power Authority. Retrieved September 2, 2013. ^ "Our power plant". Archived from the original on April 16, 2009. Retrieved July 28, 2011. ^ Kantrow, Michelle (March 12, 2013). "Punta Lima wind farm sold to Sovereign Bank for $88M". News Is My Business. Retrieved September 7, 2013. ^ "Sonnedix and Yarotek reach commercial operation of 16 megawatt photovoltaic solar energy project in Puerto Rico | Sonnedix". Sonnedix. Retrieved 20 November 2017. ^ a b "Central San Juan" (in Spanish). Puerto Rico Electric Power Authority. Retrieved September 2, 2013. ^ "27 MW Photovoltaic Plant". TSK. Retrieved 20 November 2017. ^ Alvarado León, Gerardo (August 29, 2013). "Funcionando a máxima capacidad el parque eólico de Santa Isabel". El Nuevo Día (in Spanish). Retrieved August 29, 2013. ^ "Finca de Viento Santa Isabel". Pattern Energy. Retrieved August 29, 2013. ^ "En Ponce la finca fotovoltaica más grande". La Perla del Sur (in Spanish). Retrieved September 7, 2013. ^ "Integrating Renewable Energy into the Transmission and Distribution System of the U.S. Virgin Islands" (PDF). Archived from the original (PDF) on May 10, 2013. Retrieved May 31, 2014. ^ "La AEE es" (in Spanish). Puerto Rico Electric Power Authority. Retrieved August 6, 2013. ^ Unión de Trabajadores de la Industria Eléctrica y Riego vs. Héctor Medina Torres , 2011 CD 01 (November 7, 2011). ^ "Edición 14 de Abril 2014 by El Vocero de Puerto Rico". ISSUU. Retrieved 2015-03-03. ^ "Gobernador y Junta Gobierno discuten finanzas AEE | El Vocero de Puerto Rico". Elvocero.com. Retrieved 2015-03-03. ^ a b "Financial Statements, Required Supplementary Information and supplemental Schedules" (PDF). Pr.gov. Retrieved 2015-03-03. ^ "AEE solicita al gobierno que suelte dinero para que agencias puedan pagar la luz – Metro". Metro.pr. Retrieved 2015-03-03. ^ "Revisarán subsidios AEE y deudas de gobierno – Metro". Metro.pr. Retrieved 2015-03-03. ^ "Subsidios por $1 millón al día". Archived from the original on May 31, 2014. Retrieved May 31, 2014. ^ "Propuesta #4". Bajemos la factura. Retrieved 2015-03-03. ^ a b Alvarado León, Gerardo (June 3, 2014). "Legislatura evaluará los subsidios energéticos". El Nuevo Día (in Spanish). printed version. ^ "Propuesta #3". Bajemos la factura. Retrieved 2015-03-03. ^ "Sube como la espuma la deuda millonaria que tiene los abonados de residenciales públicos con AEE -NotiUno 630 | Primeros Con La Noticia". Notiuno.com. 2014-06-20. Retrieved 2015-03-03. ^ "UPDATE 1-Fitch cuts Puerto Rico electricity authority's rating again". Reuters. 2014-06-11. Retrieved 2015-03-03. ^ Mary Williams Walsh (2 July 2017). "Puerto Rico's Power Authority Effectively Files for Bankruptcy". Retrieved 17 April 2018.